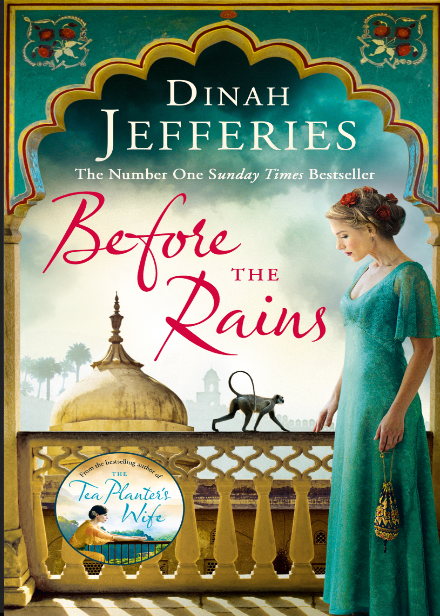 ‘Before The Rains’ is the latest book by Dinah Jefferies. 1930, Rajputana, India. Since her husband’s death, 28-year-old photojournalist Eliza’s only companion has been her camera. When the British Government send her to an Indian princely state to photograph the royal family, she’s determined to make a name for herself. But when Eliza arrives at the palace she meets Jay, the Prince’s handsome, brooding brother. While Eliza awakens Jay to the poverty of his people, he awakens her to the injustices of British rule. Soon Jay and Eliza find they have more in common than they think. But their families – and society – think otherwise. Eventually they will have to make a choice between doing what’s expected, or following their hearts. .
‘Before The Rains’ is the first book that I’ve read by Dinah and it was a lovely gentle and exotic introduction to the author. The story is seen from the perspective of Eliza, who has been sent to India to photograph the Royal family, in her adventure, she is hoping the escape the heartbreak of losing her husband and is looking forward to throwing herself into her work. But, the last thing she expects, is to find herself attracted to Jay, a handsome and charismatic man that she is reluctantly drawn to. As the story progresses and Eliza and Jay find themselves drawing closer to each other, Eliza begins to feel her broken heart begin to mend and begin to feel happier in life. But just Eliza begins to find happiness, all that is taken away when a secret from her past is revealed and her new relationship is put into question when prejudices are pitted against the couple. Set against the swirling colours of India, this romantic tale makes for fascinating and insightful reading, with a strong and independent female lead and brooding hero, this suspenseful and thrilling story is riddled with secrets and drama and was impossible to put down. You can pre-order Before the Rains from Amazon and will be available to buy from good bookshops from 23rd February 2017.